We spent the morning catching up on our night's lost sleep in our freezing Uyuni hotel room. Due to 5 showerless days we attempted to use the "hot water" in our rooms. There didn't seem to be any way to turn the shower knob in order to get even slightly warm water. I went to the front desk to ask for assistance, since our room fee was higher owing to the hot water. A few minutes later a young girl showed up to our door with a screwdriver. After pulling apart the shower head, switching the breaker on and off multiple times, playing with loose wires, while standing in a pool of water, the conclusion was made that our shower was broken. Bolivian shower heads are exceptionally ingenious. Instead of heating a whole tank of water, a small heater is installed in the shower head, so that the water warms up upon exit. Most of the time the wires are exposed and protruding from the shower head. Some hotels have signs reminding people not to touch the shower without turning off the breaker, but most backpackers we met had been zapped at least once (we were fine because we usually opted not to shower). Adding to the sheer brilliance of the design, the water doesn't actually ever heat up. So our shower didn't work, but that didn't actually make much of a difference. Our hygiene situation was rather desperate however, so we showered and spent at least another hour under the blankets trying to regain some body heat before heading out to visit Uyuni. Uyuni is a strange, eerie place, owing its current existence to tourists, who use it as a jump off point to visit the surrounding deserts and salt flats. 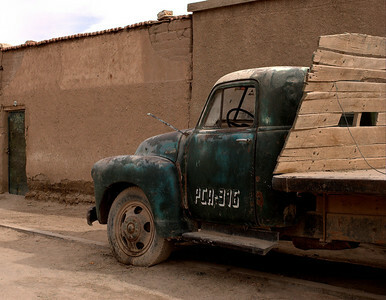 Despite its tourism potential, it remains poor and gloomy (and is one of Bolivia's coldest places). The only cars on the road are the travel agency jeeps, apparently owned by the same few people. Locals rent the vehicles and attempt to eke out a living stuffing as many backpackers into them as possible. Every other storefront in Uyuni is a travel agency. All promise roughly the same trip, prices vary wildly as does service, but not necessarily in a correlated fashion. We were weary about the trips, some of the summer's headlines about Uyuni included "13 tourists burn to death in Bolivia car accident" and "3 tourists die in crash on Bolivian salt flats, raising death toll to 16 since May". We spent the afternoon visiting agency after agency, hearing the same story of "best food, English guide, new jeep...". The reality of the situation was that no matter how carefully we chose our agency, the morning of departure we could be clumped together with another agency if our jeep wasn't full to capacity (6 tourists). To make matters worse, there was a shortage of fuel in the region, and only the agencies that were first in the queue at the gas station the next morning would be able to depart. Only a few of the high end agencies had reserves of fuel. With the national referendum in two days, we had to depart the next day, because all travel was prohibited on the day of the referendum (once we were in the uninhabited desert we wouldn't have any problems). We sought out the agency with tourists already booked to leave the next morning and a guarantee of fuel (a bold face lie), even though it was not the cheapest. After we made our selection (which we immediately doubted), we bought supplies (extra water and food) before walking out to see Uyuni's only tourist attraction. 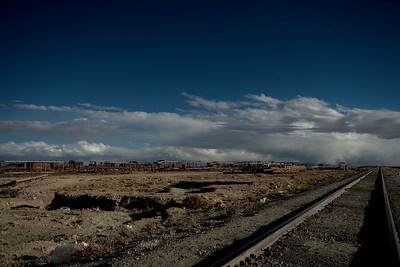 About 2km from Uyuni is the train cemetery. 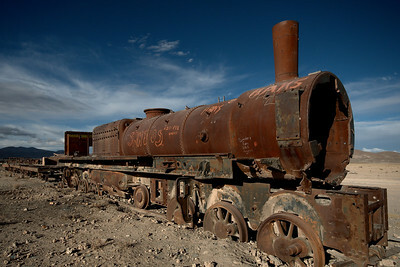 A dump of old train cars and parts abandoned to rust and decay. Upon friends' recommendation we visited in the late afternoon when the sun was setting and the tour groups had long finished their ten minute visit. The sight was well worth the two hours or so that we gave it. 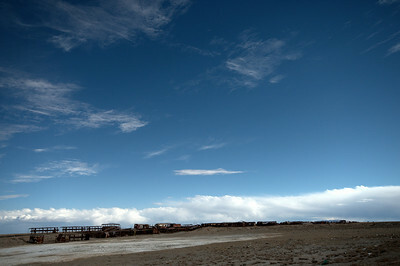 We walked up and down the kilometers of train which lay in the unforgiving desert. 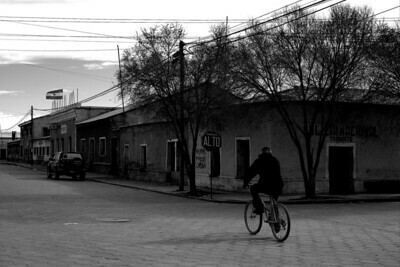 As the sun set we headed back to Uyuni to get ready for our morning departure.